“The alarm on my watch wakes me and for a second I forget where I am. I was dreaming of home, of family or some other far off place, but that is all gone now. I am back in Zambia, back in a bunk bed covered by a mosquito net and it is 4:45am. Time to move. Allen and I are up in an instant, pulling on clothes and making our beds. Even though the sun is still hours from rising, I can hear the campers rustling around and getting ready for our morning aerobics session, ‘Rise and Shine’, we call it. I am just about out the door when Allen reminds me to take my anti-malarial pill. We have a contest going to see who can remember first; looks like he wins today. I pop the pill, take a swig of water and we are gone. It is still a few minutes before five, but we are still the last ones ready. The campers are all smiles. Then again, I don’t think I have seen anything but in the four days of camp so far. We excitedly chat on our way to the field. Currently they are getting a kick out of teaching their local ‘vernacular’ language to us. They say a word, tell us what it means and we repeat it. Then they laugh uproariously at our mispronunciation. ‘Muli bwanji? ‘ translates to ‘how are you?’. ‘bwino’ is the positive response. If you are feeling confident you can ask them back with ‘Kaya anzathu?.’ It may be early to be learning another language but looking back, I realize I haven’t stopped learning since arriving in Lusaka last week. These kids, these wonderful, energetic, thoughtful, hopeful kids are teaching me about Zambia. They are sharing their culture, their lives, their joys and sorrows and dreams, but this morning, it’s their language. There is another fit of giggles as Allen tries his hand at the latest smattering of words. We are at the field and now and it is time for Rise and Shine. Today Allen and I are leading the exercises. We line the 30 or so students up in the pre-dawn darkness and start them with some stretches. Soon we are into jumping jacks and pushups and just as the sun peaks up over the smoky horizon we finish with a few yoga salutations. Then it is back to the dorms for the quickest of cold showers and off to breakfast. At 9am, the little ones arrive – 40 bubbling, squirming, smiling kids pour into the dining hall. When they see us, they excitedly begin the chorus of Boom Chicka Boom (part of yesterday’s lesson and their their new favorite song). The older students roll their eyes, forgetting that one or two years ago they were doing the same thing. Allen and I manage a few bits of toast and fruit before getting down to the very serious work of being silly. We will spend the rest of the morning with the young campers, singing funny camp songs, playing games and working on crafts. I remember sitting down with I-CCO director Alfred Nyirenda before camp: “These kids are coming from all over the Chawama district. Some are living with grandparents or aunts and uncles, others with more distant relatives, but all of them are orphans and all of them are in school,” he told me. Which is important as Zambia is a country full of growing opportunities. You can see it in the construction and development around Lusaka. But the first step to finding meaningful work is a full complement of education and, through ICCO’s work, these kids will get that opportunity. Camp is held between school terms and one of its goals is to give students a chance to celebrate their successes. It is also designed to instill the importance of a good education, of choosing a career, and living a healthy lifestyle. While Allen and I are here as temporary guests, we want to support the students in their educational journey as much as possible. We try to act as role-models and teachers, but also as cheerleaders and friends. Many of these students live a life that is worlds away from our own. They have lost parents and live within an aura of uncertainty, yet they manage to keep on smiling and making positive decisions. That is praiseworthy and something I am proud to support. Lunch is ready before we know it and Allen and I sit down to a full serving of nshima, the local staple. Nshima is made from corn meal and is eaten with a cabbage, tomato and onion relish. The kids dig in to huge steaming piles of it with vigor. Alfred makes sure that, at least while at camp, everyone has as much as they can eat. After lunch, the older students go to the classroom where they will meet a fellow orphan who is currently in his residency phase of becoming a doctor. Meanwhile, Allen and I have been busy with the young ones, finishing off their day with some physical activities and games. After that they load up to go home, while Allen and I prepare our afternoon lesson for the older students. The classroom is equipped with a blackboard and a score or so of desks, much like a classroom in the United States and just as in the US, primary education is guaranteed to all. However, despite good intentions, this is hardly a reality. Primary education might be ‘free’ on paper, but the uniforms, books, supplemental equipment and classroom fees and higher education can be prohibitively expensive. This can make a classroom like the one we are in out of reach for most of these students. During our lesson, Allen takes time to explain how a solid educational foundation can keep doors open for the future. We challenge the students to think of where they would like to be 20 years from now and then to work backwards to see the paths they might take to get there. A giant blazing sun is dropping behind the afternoon clouds and the sky is glazed in a golden light. I can see the I-CCO staff intermingling with campers, talking about the day’s lessons. In a moment of respite, we sit in the camp kitchen sipping on a cup of freshly brewed tea, discussing how today went and what we might be able to improve upon for next year. There is so much potential here. This camp is the perfect opportunity to drop in and make a small, albeit significant, impact on so many lives. But really, the one the most changed is likely my own. Allen and I nurse the tea and just for a moment, reflect in the serenity of silence. The stillness is broken by the cheerful banter of the women who are cooking dinner. Even though we can’t understand what they are saying, the tones are friendly and familiar. One of them comes in and offers each of us a piece of toast, which we gladly accept. With our tea finished, it is time to make our way back out to the campers. Before I know it we are playing one game or another, enjoying the company of the students. One thing I notice: the campers never ask us about why we are here. They just seem to accept us without question. We are part of the camp experience, not because we are outsiders and have special knowledge or skills to impart, but because we are sharing their space, their food and their friendship. The sun, which we watched rise a full 14 hours ago is now nestled against the horizon. Against the surrounding landscape, it looks as large as I have ever seen it. The sky is also putting on a show, lighting up in bright oranges and purples. And while the campers continue to play around us, I have to take a second to stop and stare. Sometimes, especially when you are halfway around the world, you will see something so beautiful that it will stop you in your tracks. You have to pinch yourself to remember that everything around you is real and that you are a part of it. 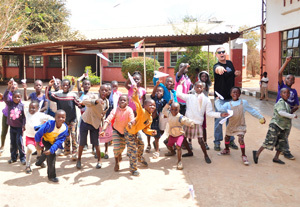 These kids, these wonderful, energetic, thoughtful kids are the next generation of Zambians. They will be the ones that stand on our shoulders to reshape the world and correct our mistakes. But right now they get to just play. I take it in in a breath, and then jump back into the netball game I have been invited into. With darkness creeping over the Chalo Trust School, we find our way towards the evening campfire: a time for stories, songs and skits. ‘Uncle’ Charles will get the chance to tell the next chapter in his never-ending tale, while Alfred has promised to dish out the weekly prizes to the most well behaved campers. A small bonfire is ignited and we all bask in its radiant light. Each group of campers gets a chance to show what they have learned this week and it is an evening full of song and laughter. Of course Allen and I participate, how could we not? After a week, we feel at home with the group. The crackle and pop of the campfire resonates in the short silences between acts and I realize that in the short time I have been here, I have been given a glimpse to another world; no better or worse than the one I come from, just different. Or at least it was before I arrived. Now I am connected. I am invested in the success of the campers, of ICCO and of INTO Giving. I am part of something that transcends countries and boundaries and cultures. Since 2010, INTO Giving has been working with In-Community Care for Orphans (I-CCO), a Zambian charity set up to provide education for orphans and vulnerable children. We have worked with the charity to raise funds to build a new school, the Chawama Centre for Education and Empowerment (CCEE). For more about INTO Giving and its projects, click here and to support INTO Giving, click here. Casey Glick is the Student Engagement Coordinator for INTO Oregon State University. In his position, he works to create opportunities that engage international students outside of the classroom and enhance their connections to communities. He is also an OSU alumnus with a MPH in International Health and a BS in Education and Health Promotion.